Under Contract In Less Than 10 Days! This Custom Built Home by Olivera Construction Has Everything and Shows Like New! Stunning Manicured Yard almost 1/2 acre, Pool View From Formal Living Room with new pavers and screen, Covered Lanai For Entertaining. This home has lots of extra details such as Crown Molding, Wood Trim Around Doors, and Tray Ceilings. 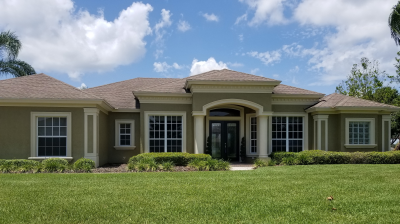 There are a total 4 Bedrooms including a Mother-In-Law Suite with access to pool bath and pool, 3 Full Baths, large Laundry Room, 2786 sq ft, 12" Ceilings in Formal Dining Room and Living Room with French Doors overlooking the pool. There is even a formal office/den with double french doors, custom closet, large window for lots of natural light and gorgeous wood flooring. The large family room not only opens to the spacious beautiful kitchen with maple cabinets, new stainless steel appliances and solid surface counter tops but it also has 2 full sides of pocket sliding glass doors that opens up onto pool deck for outdoor entertaining equipped with Bose Surround Sound. The Master Suite is entered through a small hallway for privacy and is separate from other 3 bedrooms and has two huge walk in closets, elegant bathroom with dual sinks, large walk in shower and separate relaxing tub. HOA Amenities include Gated Access, Community Pool, Clubhouse, Tennis and even a Fitness Room. This home is very easy to access to Polk Parkway, Shopping, and George Jenkins High School. This home was freshly painted on the outside in 2015.